The Fall 2017 edition of the magazine, “The Disruptive Technology Issue,” provides an interesting commentary on the idea of disruption and how it has taken shape in the technology community. The issue also highlights some of most recent disruptions and innovations. 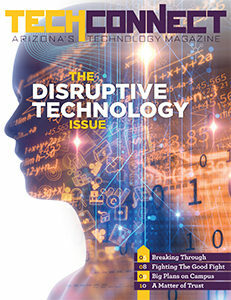 You can access and download our Fall 2017 edition of TechConnect, “The Disruptive Technology Issue” here. To submit story ideas and learn about advertising opportunities, send an email to drodriguez@aztechcouncil.org.